Latento Cylinders – Premium Quality for those who want the best. Latento cylinders are the best you can get – they set the bar in terms of innovation and design of cylinders used in solar and heat pump heating systems.. These new cylinders are not only capable of vastly superior heat collection and retention but they are designed with ease of installation in mind as their square shape allows for the maximum use of space in tight fitting hot presses and utility rooms. 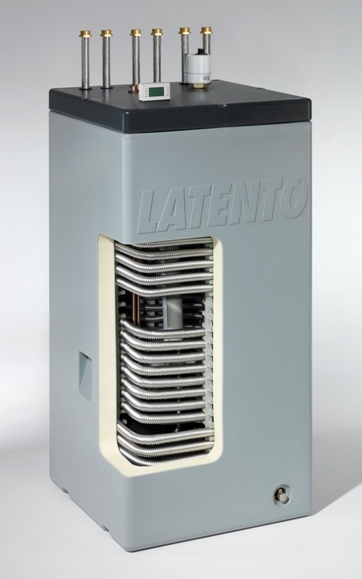 The name Latento comes from the latent heat retaining material that they include in the form of the Latento cylinder. This stores any excess heat that is introduced into the cylinder allowing for the maximum storage of energy from renewable energy systems like solar and heat pumps. The stored heat in the material is then released back into the water when the water cools. This is brilliant because it caters for the varied production nature of renewable energy i.e. they can fluctuate between high and low production over a number of days so intelligent storage is vital. This makes the Latento cylinder the next step for heat storage from solar panels and heat pumps. Latento Solar brochure – Latento’s solar range including solar cylinders, CPC solar panels and accessories. Latento cylinders are designed specifically for Solar and Heat Pump systems and also have a buffer storage system to allow for pre heat support for underfloor heating systems. If you are interested in learning more about these unique cylinders please contact us. Latento also suply their own range of solar collectors to compliment their range of cylinders. Their CPC solar collector is an extremely efficient solar panel. European manufactured, fully certifiied and a great compact size. It comes in two sizes a 12 tube (2m2) version and a 18 tube (3m2) version. It is the ideal solar panel to use in conjunction with the Latento solar cylinder.